It's a good thing that GI Joe's mission directive is to fight for freedom wherever there's trouble, because now it's not even safe to go in the water. Cobra Eel troopers are the underwater demolition specialists of the Cobra legions. They man and operate the Cobra marine outposts disguised as off-shore drilling rigs and augment the crews of larger Cobra naval vessels. Cobra Eel troopers undergo a rigorous two-part training program in the warm shark- and pirate-infested waters of the Cayman Islands in the Caribbean and in the frigid, dark depths of the North Atlantic. Their training regimen includes marine structural engineering, explosive ordnance, underwater fighting techniques and marine geology. You know, compared to some of the training Cobra troopers had to undergo, the Eels' course doesn't sound too bad. They get a tropical vacation and an arctic cruise? There must be something that's being glossed over. Like, how they have to take "polar bear club" plunges and stay submerged for five minutes or something. Or maybe free-dive until their lungs burn, then resurface before dying without getting the bends. Something harsh. The Eel is, appropriately, a repaint of the G3 Torpedo - the Joes' underwater guy has been repurposed as Cobra's underwater guy. Makes sense. The wetsuit is sculpted well, with large, thick wrinkles and a bit of piping along the seams. Cobra has obviously sprung for much more impressive uniforms than the Joe team did - the legs are grey and the top is black and red, with a silver Cobra logo on the chest. The figure gets new forearms, matching the 1985 toy, and a second belt around his waist. The head is new, since Torpedo's face was exposed and that wouldn't fly for the generic Cobra legions. Only a spot of skin around his eyes is exposed, but this is still a new head: Firefly's would have probably worked perfectly, but Hasbro still created an entirely new piece, even if it will never be seen. One of the eyes on my Eel is painted badly: there's a smear of white over the pupil in the right eye, but it just makes him look more vicious. Like Udo Kier or something. The Eel gets a lot of nice accessories; we'll start with the weapons. He's got two knives, one sheathed on each thigh, and a large harpoon gun with silver spears. Yeah, he's ready for a fight. As for underwater gear, he's fully equipped, and most of it is removable. 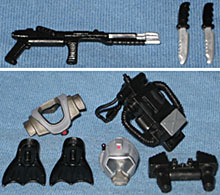 There are black flippers, grey shoulder pads, a black backpack with removable jets, and a full-head mask with a clear lens in the front. With everything on, the Eel really does look like the old version, but the fact that you can strip him down adds a lot to the value of the toy. The Eels were among the first specialized Cobra troopers. There'd already been unique soldiers, one-offs like Copperhead and Wild Weasel, but they were still being backed up by the blue-shirted troopers. 1985 is when GI Joe really started to get wild, and the Eel was right there on the ground floor.